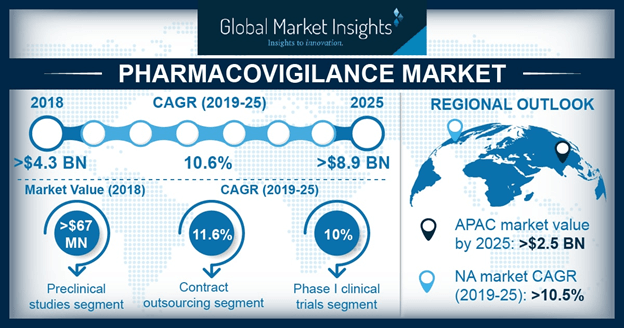 Pharmacovigilance market size was valued at USD 3.9 billion in 2017 and is expected to witness growth of around 10.7% CAGR from 2018 to 2024. Increasing acceptance and adoption of outsourcing services by healthcare companies will stimulate pharmacovigilance (PV) market growth in forthcoming years. Outsourcing eliminates the risk of business overhead costs as well as deployment of a pharmacovigilance resources. Outsourcing strategy increases the cost-effectiveness and efficiency by relieving resource pressure on firms. Positively shifting trends in PV outsourcing owing to increasing benefits will accelerate pharmacovigilance business growth in the coming years. Rising number of adverse drug reactions (ADRs) will contribute to significant increase in the market size over the forecast period. According to National Centre for Biotechnology Information (NCBI), number of fatalities due to ADRs increased more than two-fold in 2014. This further led to increase in hospitalizations. Similarly, according to data by Clinics, 2018, there was 10% increase in ADR rate in Brazil per medication introduced during hospitalization. Such escalating number of ADRs that require continuous pharmacovigilance will render lucrative growth opportunity for pharmacovigilance market to facilitate effective surveillance of ADRs. Accelerating demand for personalized medicines will impel momentous industry growth in the foreseeable future. Innovations in personalized medicine will offer growth potential to the market in ways to develop and quantitate risks and benefits of personalized medicines. Increasing advancement in targeted drugs such as new product development will further propel demand for pharmacovigilance services in the coming years. Dearth of skilled healthcare professionals needed to analyse data and implement solutions can restrict market growth. Moreover, increased risk for data security that can be misused by the pharmacovigilance personnel can hamper business growth over the coming years. Phase IV pharmacovigilance segment accounted for the largest segmental share of 75.2% in 2017. Pharmacovigilance is vital as safety surveillance after the drug is sold to patients. It detects and reports any ADRs and harmful effects that may result into discontinuation of drugs or may be limited for use. Phase IV pharmacovigilance may negatively affect company’s financial and business performance. Thus, increasing number of pharmaceutical companies along with rising number of medicines will positively impact market growth, thereby boosting segmental share. Preclinical trial pharmacovigilance segment will grow at 10.2% CAGR over the forecast period. Fast growth is attributable to accelerating number of new drug developments by pharma and biotech companies across the globe. Preclinical trial forms the foremost and crucial part of drug assessment and drug development. Thus, increasing demand for targeted therapies owing to rising number of diseases will boost segmental share in upcoming period. Outsourcing pharmacovigilance segment held largest revenue of USD 2,165.0 million in 2017. Enhanced cost-effectivity and better monitoring of drug safety will drive the outsourcing pharmacovigilance segment share in foreseeable years. Handling of large data volume coupled with regulatory compliance further attributes to increasing preference for pharmacovigilance outsourcing. For instance, many small pharmaceutical companies outsource some of its drug safety work to a third-party while 82% of medium sized and 45% large size companies outsource pharmacovigilance, that shows shifting customer preference. Above factors will highly impact outsourcing pharmacovigilance market growth. U.S. market accounted for 86.9% share of North American market in 2017. Sophisticated healthcare infrastructure coupled with stringent pharmacovigilance guidelines will augment regional growth over the projected period. U.S. FDA mandates the pharmaceutical companies to conduct post-marketing surveillance and report ADRs within stipulated time-frames. In addition, increasing funding for clinical trials will favor U.S. pharmacovigilance industry growth. India market will grow at a rapid pace exceeding USD 520 million by 2024. Strict regulations for reporting adverse drug reactions coupled with rising demand for pharmacovigilance outsourcing across the nation will foster the market growth. Lower labour cost as well as attractive market place for conducting clinical trials will positively impact the global market size. 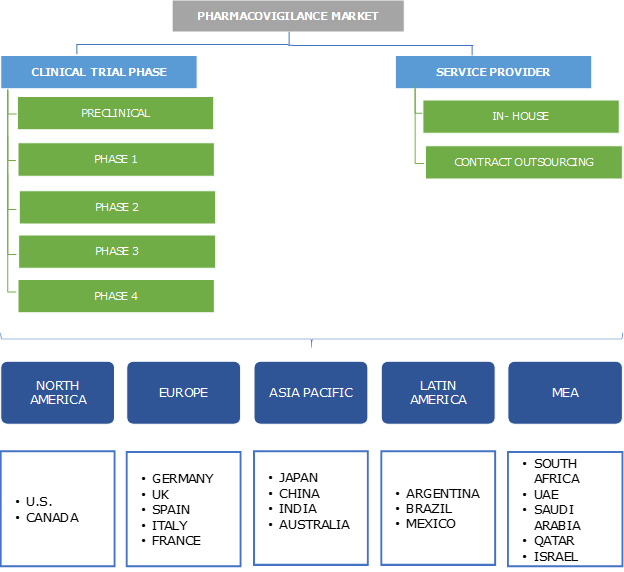 Few of the prominent market players operating in the global pharmacovigilance industry are Accenture, TCS, Cognizant, IQVIA (Quintiles IMS) and PAREXEL. Companies are implementing strategies such as introduction of new product/service along with strategic alliances to achieve significant industry foothold. For instance, in June 2015, QuintilesIMS launched Infosario One Mobile App, a mobile based application that enables access to important clinical trial information. The newly launched application provides instant access to start-up, recruitment and compliance information as well as updates on data queries. Pharmacovigilance industry witnessed remarkable developments owing to rising number of adverse drug reactions, side effects coupled with potential threats to the consumers. Pharmacovigilance was implemented in developed nations earlier in 1970s, including U.S. and UK following numerous consumer health protection acts. Increasing number of pharmaceutical companies, as well as global harmonization practices will further assist advancements in the market. Furthermore, emergence of personalized medicines and rising number of ADRs should drive pharmacovigilance industry size in the foreseeable future.